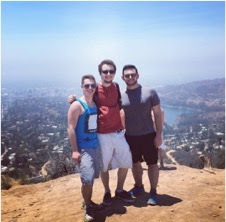 Hofstra Pride Guides: Peter went to LA! Hey! My name is Peter Charney and I am a senior pursuing a BFA in Theater Arts with a concentration in production. This summer I decided to go on an adventure! Instead of sitting around at home and binge-watching my favorite shows on Netflix, I decided to travel to the place where those shows are produced: Los Angeles, California! Fellow Pride Guide and Drama major, Justin Chesney, and I decided to make the journey from East to West coast in order to explore potential work opportunities for when we graduate from Hofstra next spring. We wanted to check out what it was like to live in Los Angeles, as well as discover what kind of opportunities they have in the entertainment industry. We were able to stay with a former Pride Guide, Tanner Alvarez, who is currently working in the TV industry as a post-production supervisor. He was able to introduce us to some of his friends who are also working in the industry along with showing us around the area. We were able to see a live taping of the Conan O’Brien show, a new movie with a Q&A talkback with the directors, and several movie and television studios. We also went to see the Dolby Theater (where they host the Oscars! ), climbed to the Hollywood sign, and went to Disneyland.